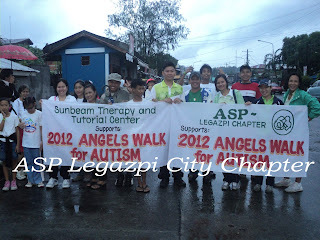 In solidarity with the whole country in celebrating the 16th National Autism Consciousness Week, participants in Legazpi City braved the strong winds and heavy rains to push through their own Angels Walk for Autism last 22 Jan 2012. The said walk started at around 5:30AM and ended at 8AM. The almost 3 km walking was so challenging to all the participants since the wind coming from Albay Gulf which is part of Pacific Ocean was so strong that mimics a typhoon signal. Yet all of the participants showed a lot of courage and unity just to finish that memorable activity to advocate for the rights and welfare of persons with autism and their families around the country. The event was spearheaded by ASP Legazpi City chapter with the support of the different Public SPED school and Non Government Organizations (NGOs) was attended by teachers, therapists, students, families of persons with autism (PWA) and other active advocates of autism. Congratulations to all the participants and supporters of the walk! To know more of ASP Legazpi City Chapter's activities, you may get in touch with Mr. Nelson Ibarra, Chapter President, at (0922) 833-9694.